James’s new book is out, and we’ve got an overview for you, telling chapter by chapter what’s in store for the reader. Tune in and find out why Work Less, Make More should be next on your reading list. 05:05 – Is your life going where you want it to? Hey, James here. Today, I want to talk to you about my new book, which is called Work Less, Make More – The counter-intuitive approach to building a profitable business, and a life you actually love. Now, this book has been a fair bit of work in the making. I have recorded a podcast. If you go back to a previous episode, you will be able to listen to Kelly Exeter and I talking about how to write a book – the whole process that was involved in making this book. I also read the introduction chapter to this book. So, you can listen to that and read the transcript. So, after the introduction is a chapter on personal effectiveness. This is where I really help set you up for success because a lot of the people who I’ve worked with are usually stuck in their inbox, and they’re a bit out of control, so they’re never going to get a successful business because they’re really being consumed by other people who put things in their inbox, which is essentially the to-do list that other people get to add things to. So, the personal effectiveness chapter really helps you work out where your energy levels are, how you can get the right amount of sleep and how you can be the most productive possible. Then we go to chapter two – planning and goal setting. I talk about the way that you might think about getting things done. Maybe it’s different to what you’ve already learnt before. There’s probably a few counter-intuitive things, and one of the keys there is to keep it on a pretty short time frame. Then we go to chapter three – focus and the power of 64:4, and as Perry Marshall said in his review, “This book is like the 80/20 squared. It really gets to the point of how much of the things that you’re probably doing in your business now don’t matter whatsoever.” I also talk about things that do matter and how to find out what they are and focus on them more. Then chapter four – building a team. This is my world-famous presentation on building a team crunched down into one chapter. I’ve presented this in Texas at Ryan Levesque‘s event. I have presented this in San Diego at Ezra Firestone‘s event. I presented it for Buck Rizvi in Colorado. And I presented it for Mindvalley in Spain. And I presented it for my own audience in Manly. This is an essential chapter. It’s really important to build a team because without a team, you’re going to be stuck on a smaller salary or a small income because you really do need other people to help you with your business. We then go to an offer that converts, which I think is actually as close as you get to the holy grail online. It’s finding that thing that people are willing to spend money with you for that you can access these people that they’re happy to get what it is that you’re selling. So, I talk about how you identify that and how once you’ve got that, it sets you up with all the keys to success. Then there’s cash flow and the profit formula. This is a profit formula that not many business owners know. If you can learn this profit formula, then you’ll always have a back-of-the-beer-coaster or back-of-the-postcard profit formula that you could quickly work on any business and make it profitable. I talk about how I’ve shared this with my kids. This is simple to understand but very powerful. And there is a little catch too. There’s a few parts of the profit formula that are far more important than the other parts, and I tell you which ones they are. Then we talk about customer lifetime value. And if you don’t know what the customer lifetime value of your customers are, then you have a problem, and I’ll teach you how to solve that. I’ll help you work out what it is, and I’ll explain to you why this number is very important for your business. Then we talk about choosing the right business model. So, if you’ve been stuck on the product launch, feast-and-famine cycle; if you sell things one time or to individuals, then this chapter is going to be powerful because I talk about my absolute favorite business model, which is the recurring subscription model. So, I look forward to sharing that. And then chapter nine is about no compromise. I really just highlight the fact that you don’t have to put up with stuff if you don’t want to. So, if your life’s not going where you want it to, if you don’t have the things that you want to have, if you’re not happy, if you don’t love Mondays, if you feel soulless about your goals, if you’re just grinding and hustling but you don’t even remember why, then this chapter will help you. And then there’s a conclusion and of course some acknowledgements. So, that’s it. This is actually a pretty short book. It only runs to around 136 pages, so you’ll be able to demolish this book in one sitting. And at the end of each chapter are these amazing action notes. So, I make a promise in the book that I will help you work less and make more, and I believe the book delivers. I’m having fantastic feedback from some of my heroes like John Reese and Perry Marshall. It’s just so good to get that. At the end of each chapter, these action steps are going to help you. So, fill out these action steps. Currently, you can go and get a workbook for this book from JamesSchramko.com, and you can get the secret hidden chapter from JamesSchramko.com. 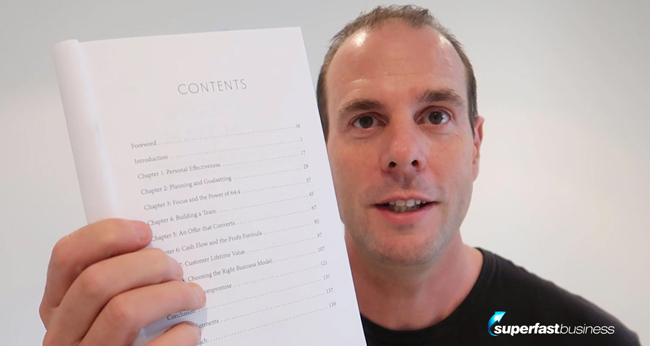 The secret hidden chapter will help you create a publishing model that means you never have to rely on affiliates, you won’t have to rely on any one advertising platform, and it will work for you even while you are asleep. It’s very powerful. It takes a little bit to set up but it will last for a long, long time, and it’s the prime publishing model that I use for my business. So, it’s very exciting. I hope you’ve enjoyed it. If you do get the book and you love it, please, please, share it with someone else and review the book on Amazon because that would really help other people find the book and that would be a great thing to do. Thank you so much. I’m James Schramko, and you’ve been watching the Work Less, Make More overview episode. Way to go James, can’t wait to read it! Thank you so much!!! if you could possibly leave a review on Amazon that would be amazing!!!! I expect 2018 will be a great year for you.